The Royal George Hotel01291 689205work HotelLocated in the charming village of Tintern. The Royal George is an elegantly refurbished hotel with a wonderful cosy and dog friendly pub and exquisite restaurant. We pride ourselves on using locally sourced produce and seasonal menus to showcase the very best of the Wye Valley. Located in the charming village of Tintern. The Royal George is an elegantly refurbished hotel with a wonderful cosy and dog friendly pub and exquisite restaurant. We pride ourselves on using locally sourced produce and seasonal menus to showcase the very best of the Wye Valley. The Royal George has 14 stylishly decorated en-suite bedrooms, each with their own individual flair. We offer 4 dog-friendly rooms fully equipped with everything your furry friend will need on their travels, our pub also offers dinner for dogs too! 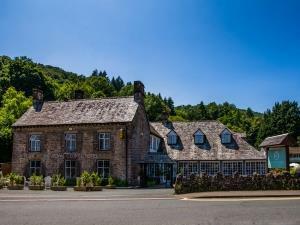 set in the beautiful historic village of Tintern The Royal George is a perfect place to stay whilst exploring the local area providing a laid-back luxury approach to accommodation with superb on-site dining and a deliciously tempting breakfast. We have 5 dog friendly rooms with handmade dog beds and treats during each guests stay and our Pub The Wild Hare is dog friendly with a dogs menu of pigs ears, raw hide and gravy bones! Children welcome from any age.